This is an easy bread to make for your holiday festivities and it tastes great too! It goes well w/ roasted turkey, vegetables, pasta or whatever you’re cooking up. 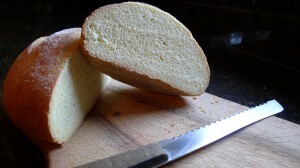 The cornmeal adds a nice texture and flavor to ordinary rolls or a boule. I like to slice the boule, wrap it, then put it in the freezer. That way it stays fresh and is readily available when I need a couple of pieces of bread to toast. 12) After 10 minutes, rotate rolls front to back for even baking and bake for 10 additional minutes. Remove rolls from oven, tap the bottoms; if it makes a hollow sound they’re ready. Leave boule in at 450 degrees for 10 more minutes then reduce oven temperature to 375 degrees F, rotate boule front to back and bake for 10 additional minutes. Tap bottom as you did w/ rolls to determine readiness. It’s gotten cold and snowy here in St. Louis so I’m enjoying baking because it warms up the house. 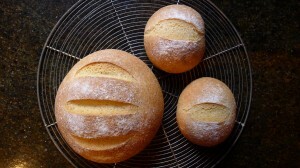 Having fresh, homemade bread around is an added bonus!